At first, modern medical institutions were skeptical of the benefits of acupuncture. However, since its introduction to the western world in the seventies, there has been an overwhelming number of claims that people can benefit from this method of pain relief. What is Acupuncture and is it Useful for Pain Relief? For more than 3,500 years the Chinese have been practicing acupuncture. This procedure involves applying very thin needles, heat and pressure to specific body points. By stimulating these points, the body’s natural energy is redirected. The illnesses and pain that stem from blockages or imbalance in this natural energy are swept away. The needles are so thin and painless, that acupuncture is considered as a non-invasive therapy. For what type of Pain is Acupuncture Effective? Studies from the National Institute of Health (NIH) indicate that acupuncture works well on many types of chronic pain, including back, neck pain, and shoulder pain, osteoarthritis/knee pain, nerve pain, fibromyalgia, menstrual cramps, and headaches. It is a fact that almost 3.5 million Americans claimed to have had acupuncture treatment in the previous year. There is no doubt that for some people, acupuncture works for pain management. Your expert pain doctor is able to suggest a certified acupuncturist to alleviate your pain. 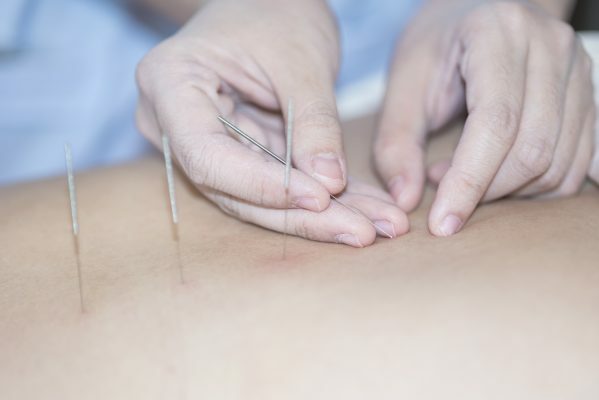 Your acupuncturist usually inserts four to ten thin needles into specific areas of your body. The needles remain in place for 30 minutes while you rest. Treatment typically includes six to twelve sessions over three months. There are several various types of acupuncture. Traditional Chinese: Very fine needles are inserted into specific acupoints. Your therapist may turn the needles slightly or use heat or electrical stimulation to magnify the effects. Japanese Acupuncture: Usually the fine needles are not inserted as far as the Chinese method. The therapist does not twist or manipulate the needles as happens with the Chinese approach. Korean: The needles are applied to the hands and feet, instead of other points in the body. Acupressure: Instead of inserting needles, your therapist uses his or her hands to apply pressure to the acupuncture points. Acupuncture is considered a non-invasive therapy, but certain health conditions may be an issue. Bleeding Disorder: If you have a bleeding disorder or are on blood thinners, the insertion of even these small needles is not advisable. You could bleed or develop bruises from the procedure. Pacemaker: If you are using a pacemaker, the mild electric shocks associated with the procedure will interfere with the operation of your pacemaker. Pregnant: Acupuncture may stimulate labor and premature birth of your child. The results of medical studies vary regarding the effectiveness of acupuncture for pain. Some have positive results while others suggest there is no real effect. In some of the reviews, there has been a comparison of treatments with standard acupuncture methods to “sham” acupuncture. “Sham” acupuncture are methods that mimic acupuncture, like a sugar pill as a placebo, but are not true to the practice of acupuncture. Scientifically there are no definitive answers. Even with research that involves a meta-analysis of many studies there are no conclusive results. However, it is recognized that the methods of comparison in such studies are difficult. Scientifically the benefits of acupuncture are still unsubstantiated. Yet many patients report positive results. Traditionally not all medical drugs or procedures have been well understood before they were widely accepted as helpful. Many drugs and medical procedures in the past have been used effectively without detailed scientific study about the exact mechanisms that are involved. One prime example is aspirin. More investigation of the mechanisms involved in acupuncture is continuing. It could be true that acupuncture could be very effective for certain people but not everyone. It is comforting that certified acupuncturists have undergone extensive training. While not all states require certification for acupuncturists, more and more states are making this requirement as the practice becomes more popular. However, certification form the National Certificate Commission for Acupuncture and Oriental Medicine (NCCAOM) is available to all practitioners. When you visit a pain treatment clinic for acupuncture treatments, you can ask about the qualifications of the therapists. There are many ways to locate a qualified acupuncturist. Try these methods. Ask for a referral from your pain doctor in New York or pain doctor in New Jersey. Even though Medicaid and Medicare do not cover acupuncture, some insurance companies do. You need to check your company to confirm whether acupuncture is recognized for your situation. You may want to make a list of questions to ask. Here are some suggestions. What number of treatments can I receive under your coverage? Is a referral from my doctor required for coverage for a visit to an acupuncturist? What are medical conditions for seeking the help of an acupuncturist covered? Is it only for pain relief? Is stress relief covered for example? What type of acupuncturist do I need to see to be covered? Are some acupuncturists not covered? How will the payment for the service be handled? Do I pay up front and then seek reimbursement? Acupuncture is effective for many types of pain relief for many people. Some acupuncturists are certified by the national organization, NCCAOM. Some insurance companies cover visits to an acupuncturist for certain conditions.